Mobile Website - R.D. Fink Agency, Inc.
We strongly encourage you to visit m.rdfink.com right now on your mobile phone so you can bookmark it for later access. This way the valuable information will be at your fingertips when you need it. 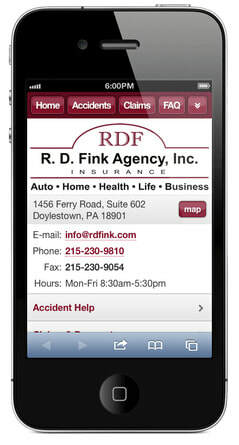 To visit our mobile website, simply visit rdfink.com on your mobile phone. Or, you can scan this QR code using a QR reader app on your phone — no typing required!